Using keywords to discover what your audience is looking for is an integral part of good Search Engine Optimization (SEO) practice and a fantastic way of promoting your brand. Well, keywords are the words and abbreviations which web crawlers (also called spiders) search, pick up, and categorize to deliver the most relevant webpages to particular searcher. They’re one of the most basic elements in any web search and are key to promoting any campaign and marketing any website. Keyword research is best used in a few areas: before you start a new marketing campaign, before you start a new website, or for background information before you write a blog or web post. Basically, researching relevant keywords will help you hone your content in on your audience and what your audience is looking for. Let’s say you already have a website, but would like to start a marketing campaign for a new product. Before you begin promoting material online you’ll need to do a broad search of who, what, and where your audience is, as well as how they’d use your product. Doing this can lead to the right keywords and keyword phrases they’d use to find you. So how do we find the right keywords? Well, thankfully, there are a few services which discover keywords for you to use. We’re going to focus on the free services out there — namely Google Adwords and Google Trends. 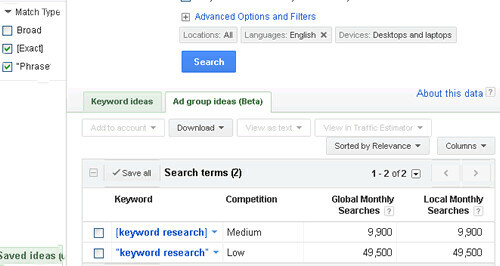 Google Adwords is the quintessential keyword research service. It’s free, but you’ll need to sign up for the best results. Using Adwords is simple: just enter your keywords or keyword phrase, with a few variations, into the bar at the top of the site and press enter. Google will then show you most used keywords associated with your search. You can also ask Adwords to search for your exact phrases by clicking the “[Exact]” and “Phrase” boxes on the left panel under “Match Types” (be sure to uncheck “broad” as well). What pops up are frequently used keywords across the web filtered into many categories. Poke around and consider integrating the best keywords with your material. Just as important as finding the most relevant keywords is finding the most relevant trending keywords. If the keywords you now use are trending down in usage you’re probably hurting your website’s stats. To prevent this, check out Google Trends, which can help you track the popularity and usage of particular keywords over time. Google Trends also lets you use Google’s database of searches to find, and track, popular keywords. Finding and using keywords and keyword phrases organically within your copy will help your rates and keep a nice keyword density throughout your site. Jamming every relevant keyword in the first 50 characters of a blog post will feel forced and distract from your content. It’ll also likely hurt your standings on search engines. And here’s why: search engines look for a lot more than just keywords, so loading your website up with a bunch of irrelevant keywords in the hope of pulling page views won’t do you any favors, and, in fact, will count against you on most search engines. Say you sell dog shampoo and you maintain a blog about proper dog care on your grooming website. If you were going to write a new post on washing, what would the title be? “How to Wash Your Dog” sounds fine, but there’s room for improvement. If you go to Google’s homepage and enter “how to wash your dog” you’ll notice the service automatically generates similar searches, usually with small modifiers like “outside,” “at home,” or “without water.” Google is suggesting the most popular, and most recent, searches related to your query. By using this basic search you’re finding the most organic and popular keywords for immediate use (not for a long-term campaign). If you make the title of your blog post “How to Wash Your Dog Outside,” or “How to Wash Your Dog At Home,” you’ll both net a lot more visitors than you initially would have, and you’ll help to make your blog post more specific and catered to your audience. And that’s what keyword searches are about: audience. By researching the most relevant, and trending, keywords you can make informed changes to your website’s content to reflect the wants and needs of your audience. A single blog post incorporating keywords will do little to help your site, but a site-wide makeover — or a well-researched campaign — integrating what you offer, and how you can help potential customers, will help you get to the top of everyone’s search. John Gower is an analyst at NerdWallet, a website dedicated to helping consumers find the best CD rates, credit cards, checking accounts and more.